Income-tax Appellate Tribunal was established on 25th January 1941, celebrated it’s 78th year of foundation day, across the Country. 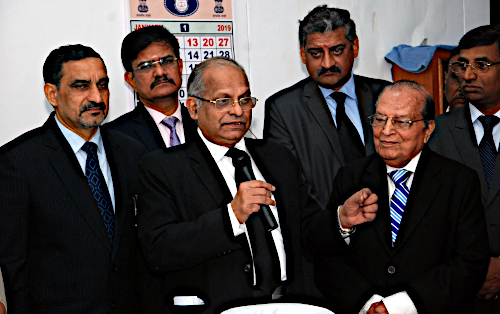 On the occasion of the Foundation day celebration at the ITAT Mumbai, Honourable Justice Mr. P. P. Bhatt, President of the ITAT, inaugurated Committee room at fourth floor of the present premises of the ITAT. A grand function was organized by the ITAT in the Member’s library wherein a mobile application of the ITAT was also launched, which can be downloaded by the professionals and tax payers. Speaking on the occasion Honourable Justice Mr. P. P. Bhatt President of the ITAT shared his vision. He has emphasized that this glorious institution needs proper infrastructure so that the efficiency in administration of justice will be improved. Honourable President desires quick disposal of matters. One may visit the message of the Honourable President which is published on www.itatonline.org. On the said occasion, Honourable Vice President Mr. G. S. Pannu, Honourable Vice President Mr. Joginder Singh, Honourable Members, Departmental representatives, members of the Bar and others were present. Dr. Y.P. Trivedi, Sr. Advocate, Past President of the ITAT Bar Association, shared his experience in this great institution and congratulated the Honourable President Vice -presidents for holding a celebration function at Mumbai and other places. He stated that we have to maintain the past glory and meet the challenges. 1. In one of the instances, when he was arguing in court Room No. 11, the then Vice -President Mr. M. K. Chaturvedi was heading the Bench. The issue involved was with respect to the allowability of remuneration paid to Wife by Husband. Officer disallowed all the expenses. When matter was argued, the Honourable Vice President said that the matter could be sent back to the AO for verification. Dr. K. Shivaram pointed out that the assessee was 70 years old and if the matter goes back, it may take another 10 years. Bench asked whether the assessee was present in the court room. The assessee was sitting in the last row. The assessee was requested to stand in the witness box, where the DR was asked to cross examine the assessee on the spot. Accordingly, the order was pronounced in the open court. Appeal was allowed. 2. In another such instance where, early in the morning, the briefing CA informed that unless the stay was obtained from the tribunal, the Officer would attach the Bank Account by 11 AM. The mentioning had to be done before the Court without filing any stay application, stating that there was no time to file stay petition. Unless the stay was obtained, the Bank account would be attached. Honourable Bench said, alright, you file the stay petition today, we will hear you tomorrow. Bench orally directed the departmental representative to inform the Officer via a phone call that the court had directed him not to recover the amount till the stay petition was heard. There could be a number of instances like this which have built confidence of the public in this institution. On the occasion of foundation day, contribution of the ITAT Bar Association to maintain the independence of this institution deserves to be acknowledged. One may refer to the supreme court judgments in the cases of ITAT v. V.K Agrawal (1999) 235 ITR 175 (SC) (182) and Ajay Gandhi v. B. Singh (2004) 265 ITR 451 (SC). Regarding infrastructure, additional spaces were allotted to the ITAT by the Court in a PIL filed by our Bar Association in the case of ITAT Bar Association v UOI WP NO 624 of 1999. Dr. K. Shivaram also stated that at present there was no institutionalized process of elevation of the Members of the ITAT to the High Court. He was of the opinion that there are a good number of Judicial Members who deserve to be elevated to the High Court. He also stated that AIFTP has made representation to Honourable Chief Justice of India and also to the Honorable law Minister. He emphasized that honourable President, being from the judiciary, would be able to help in this regard and when the foundation day is celebrated the next year, some positive development could be expected. Foundation day celebration were also held at Pune, Ahmadabad, Kolkata, Bangalore and Delhi.